Does the rise of identity politics spell doom for liberal democracy? Political scientist Francis Fukuyama famously declared 26 years ago that liberal democracy was the pinnacle of human development. Now, he warns that the rise of identity politics could doom us to continued conflict. Fukuyama's new work, Identity, Contemporary Identity Politics and the Struggle for Recognition, delivers a stark message: The rise of identity politics poses a significant threat to modern liberal democracies. For instance, he argues American institutions have been decaying as the state has been "progressively captured by powerful interest groups" and locked into a rigid structure that is unable to reform itself. He cites US President Donald Trump as "both an the product of and a contributor to that decay". Indeed, Fukuyama says his new book would not have been written but for his shock at Trump's election and the UK public's vote to leave the European Union. The packed event was also supported by De Balie, the Dutch discussion forum on art, culture and politics, and Fukuyama's Dutch publisher Atlas Contact. The talk was moderated by De Balie's Yoeri Albrecht, who had interviewed Fukuyama about a previous book, The End of History and the Last Man, years two-and-a-half decades before. Twenty six years ago — a blink of an eye in terms of history — Fukuyama was feted for a very different message in his book The End of History. The global best-seller was inspired by an essay, The End of History?, which was published in 1989 just before Soviet-style communism imploded in Russia and Eastern Europe. Fukuyama was interpreted as saying history, in terms of a clash of competing political philosophies, was 'over', with liberal democracy based on the market economy emerging triumphant over the ruins of communism. Fukuyama's latest book, and indeed other works he has penned since The End of History, seek to explain both how his original premise was misunderstood and why liberal democracy risks being knocked off its pedestal. It looked so good for awhile. There were 35 elected democracies in 1970, rising to 120 in the early 1990s thanks partly to the collapse of Russian communism. The trend reversed in the 2000s as the total number of democracies declined, and authoritarian regimes grew in confidence. Fukuyama acknowledges the economic hardship caused to many people by the Global Financial Crisis of 2008. But he says this is insufficient to explain this new tide of populism. Noting that nationalism and religion have not disappeared either as political forces, Fukuyama traces the phenomena back to liberal democracy's inability to solve the "problem of Thymos". Thymos, he explains, is the part of the soul that craves for the recognition of dignity. Isothymia is the demand to be respected as an equal to other. While liberal democracy promises a degree of equal respect, it does not guarantee it in practice. In addition, liberal democracy is not currently offering a sufficient safety value for Megalothymia, the desire to be recognized as superior. No surprise therefore that the language of populism is littered with talk of being disrespected and insulted, and for the "people" to take back control from the "elites". Governments influenced by populism are shying away from international cooperation and collective action. Fukuyama says sections of the public are being "seduced by leaders who tell them that they have been betrayed and disrespected by the existing power structures". This has led to the weakening institutions that underpin democracy such as independent media and courts. 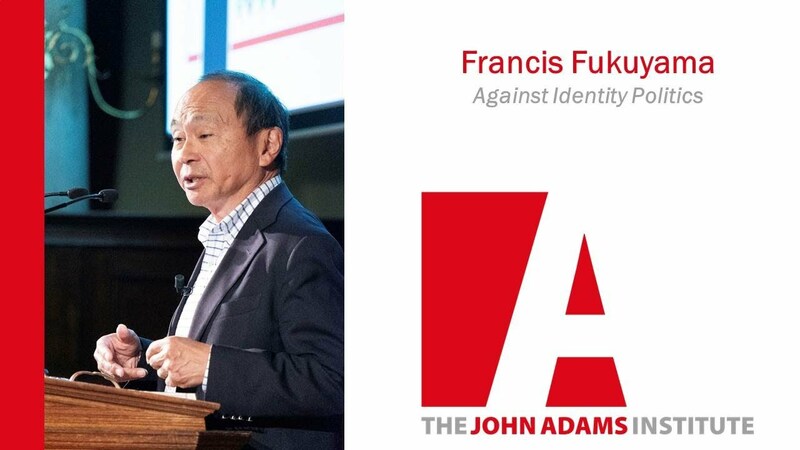 Fukuyama says that we can't get away from identity or identity politics. He makes a plea, however, for an attempt to create common identities. He is critical, for instance, of the European left which has in recent decades supported multiculturalism at the expense of integrating immigrants into the national culture. "Ideally, the EU should create a single citizenship who requirements would be based on the adherence to basic liberal democratic principles, one that would supersede national citizenship laws. Shifting powers from the European Commission to Parliament, he says, would help democratize the EU. More broadly, Fukuyama suggests forms of national service would also help create a common identity, as would tackling the issue of dual citizenship. Indeed, any and all measures that help create an identity that can be used to integrate could, Fukuyama says, be remedy for the populist politics of the present. History will tell whether this can be achieved.